The Indianapolis Colts today signed guard David Arkin from the practice squad to the active roster and placed tackle Gosder Cherilus on Injured Reserve. The team also signed wide receiver Kadron Boone to the practice squad. Arkin was signed to the practice squad on September 16, 2014. He has played in one career game with the Miami Dolphins in 2013. Arkin was originally selected by the Dallas Cowboys in the fourth round (110th overall) of the 2011 NFL Draft out of Missouri State. He spent his first three seasons (2011-13) with the Cowboys before joining the Dolphins in 2013 and the Seattle Seahawks in 2014. Arkin was a four-year starter at Missouri State and became only the third player in school history to earn All-Missouri Valley Football Conference honors every year. Cherilus started the first 14 games of the season and was inactive for the last two contests. Prior to missing the two games, he had started 60 consecutive games from 2011 to 2014 with Detroit andIndianapolis. For his seven-year NFL career, Cherilus has participated in 105 games, making 101 starts. He has also started three postseason contests. Cherilus was originally signed by the Colts as an unrestricted free agent onMarch 13, 2013. Boone, 6-0, 204 pounds, was first signed by the Philadelphia Eagles as an undrafted free agent out of LSU on May 10, 2014 and was waived on August 23. He was then signed to the St. Louis Rams practice squad on October 21 and was released on October 29. Boone finished his collegiate career with 611 receiving yards and eight touchdowns in 51 games played at LSU. In 13 games (seven starts) as a junior in 2012, he ranked second on the team in touchdown receptions (four) and third in both receiving yards (348) and receptions (26). He also added a pair of touchdowns in 2011 and 2013. The NFL today announced that Indianapolis Colts outside linebacker Jonathan Newsome has been named the AFC Defensive Player of the Week for Week 17. This marks the first time he has earned the award in his career. Newsome made his first career start at RUSH linebacker in the Colts’ 27-10 victory over the Titans last week and recorded a career-high eight tackles (seven solo), tied a personal-best with 2.0 sacks and added a forced fumble. It was his third multiple-sack game of the season, which was the most among NFL rookies in 2014 and tied the record for the most such games by a rookie in team history. Newsome finished the season with 34 tackles (26 solo), a team-leading 6.5 sacks and three forced fumbles. His sack total ranked third in franchise history among rookies and was the second-highest mark among NFL rookies in 2014. Newsome became the first rookie to lead the Colts in sacks since Dwight Freeney in 2002. Newsome is the fourth Colts player to earn AFC Player of the Week honors in 2014, joining QB-Andrew Luck (Week 3), P-Pat McAfee (Week 6) and ILB-D’Qwell Jackson (Week 13). He is the first Colts rookie on defense to earn the award since Freeney in 2002. INDIANAPOLIS – The Colts (11-5) ended their 2014 regular season with yet another divisional victory. In the Colts 27-10 win on Sunday afternoon, the AFC South champions swept the division for a second straight season. Now, the Colts will turn their attention to the playoffs and their Wild Card matchup with the Cincinnati Bengals (10-5-1) on Sunday at 1:05 p.m. EST. ONE FINAL WIN—The Colts didn’t seem to have anything to play for in Week 17 but you couldn’t tell that by listening to coaches and players in the days leading up to Sunday. Outside of a few injuries, Sunday was a productive afternoon for what the Colts were hoping to accomplish from a momentum standpoint heading into January. ANDREW LUCK SETS FRANCHISE RECORD– It was just two quarters of work for Andrew Luck on Sunday but he made the most of that time. Luck was 10-of-16 for 160 yards and two touchdowns in the season finale. Luck also set a Colts franchise record for passing yards in a single season (4,761). ROOKIE PASS RUSH LEADER – The Colts leading sacker in 2014 was rookie Jonathan Newsome. On Sunday, Newsome added two more sacks and wrapped up his first season in the NFL with 6.5 sacks. He finished the year with the second most sacks of any NFL rookie. Newsome’s presence off the edge will be vital come January. DIVISION DOMINANCE – Sunday marked the 13th straight divisional win the Colts have piled up, dating back to the end of 2012. In sweeping the division for a second straight year, the Colts are once again the dominant team in the AFC South. The Colts six divisional wins this season came by an average of 16.6 points per game. WILD CARD MATCHUP – It will be a short trip up I-74 for the Cincinnati Bengals (10-5-1) in their Wild Card matchup with the Colts next Sunday. The 1:05 p.m. EST kickoff will be a rematch of the Colts 27-0 victory back in Week Six. In that earlier matchup, the Bengals did not have perennial Pro Bowl receiver A.J. Green. If the Cincinnati-Pittsburgh game tonight ends in a tie, then Baltimore at Indianapolis will be Saturday night of Wild Card Weekend, and Pittsburgh at Cincinnati will be Sunday at 1pm ET. The NFL today announced that five Indianapolis Colts players have been selected to the 2015 Pro Bowl: CB-Vontae Davis, WR-T.Y. Hilton, QB-Andrew Luck, P-Pat McAfee and K-Adam Vinatieri. S-Mike Adams and ILB-D’Qwell Jackson were selected as alternates. The game will be played on Sunday, January 25, 2014, at University of Phoenix Stadium in Glendale, Ariz. This marks the first time since 2010 that five Colts players have been named to the Pro Bowl in a single season. Davis, Hilton and McAfee have earned the honor for the first time in their careers, while Luck and Vinatieri have been named to the Pro Bowl three times apiece. In 14 starts this season, Davis has compiled 41 tackles (36 solo), a career-high and team-leading 19 passes defensed, a career-high-tying four interceptions and one forced fumble. His passes defensed total currently ranks first in the AFC and second in the NFL, while his four picks rank tied for fourth in the conference and tied for seventh in the league. In a 27-0 victory over Cincinnati in Week 7, he tallied a single-game career-high four passes defensed, as the Colts held the Bengals to 135 total net yards in the shutout. Over the past two seasons (2013-14), Davis has posted 31 passes defensed, which ranks tied for fifth in the NFL. He was originally acquired by the Colts in a trade with the Miami Dolphins on August 26, 2012 and since that time, he has recorded 142 tackles (118 solo), 39 passes defensed, eight interceptions, one forced fumble and 1.0 sack in 40 games played (all starts). Hilton has posted career highs of 82 receptions for 1,345 yards and seven touchdowns in 14 starts this season. He ranks third in the AFC in receiving yards, fourth in receiving first downs, tied for fifth in receptions and tied for 10th in receiving touchdowns. Hilton topped 1,000 receiving yards for the second straight year and became only the third player in franchise history with multiple 1,000-yard receiving seasons. He also has six 100-yard performances this year, which is tied for the fifth-most in a single season in team history. In Week 6 at Houston, he tallied 223 receiving yards and set an NFL record for the fewest games to record a 200-yard receiving performance in the regular season and postseason, as he accomplished the feat in his 40th career game. Hilton has registered the most receptions, receiving yards and 100-yard receiving games in the first three seasons of a career in Colts history, while his touchdown total ranks second. For his 45-game career (25 starts), he has made 214 receptions for 3,289 yards and 19 touchdowns. Hilton has also returned 43 punts for 459 yards and a touchdown and eight kickoffs for 118 yards. He was originally selected by the Colts in the third round (92nd overall) of the 2012 NFL Draft out of Florida International University. Luck has completed 370-of-600 passes (61.7%) for career highs of 4,601 yards, 38 touchdowns and a 95.4 passer rating in 15 starts in 2014. He has also rushed for 268 yards and three touchdowns on 63 attempts. Luck ranks second in the NFL in passing touchdowns, third in passing yards and fifth in completions. He joined Johnny Unitas (one) and Peyton Manning (six) as the only quarterbacks in franchise history to throw for 30-plus touchdowns in a single season and became the third-fastest player to reach 12,000 career passing yards in NFL history. Luck has posted 10 300-yard passing games in 2014, which set a single-season franchise record (Manning, nine in 2004). He established a team record with eight consecutive 300-yard passing games from Sept. 21 – Nov. 17, 2014. Luck became the first player in NFL history with at least 350 passing yards in five consecutive road contests from Sept. 7 – Nov. 3, 2014. He set a single-game career-high with five touchdown passes against Washington on Nov. 30, 2014 and became the first quarterback in franchise history to throw for two touchdowns of 70-plus yards in a single game. Luck earned AFC Offensive Player of the Month honors in November and AFC Offensive Player of the Week accolades in Week 3. Luck has led the Colts to 32 victories since 2012, which is tied for the fourth-most to start a career since 1970. He has also thrown for the most passing yards in the first three seasons of a career, as he joined Peyton Manning and Dan Marino as the only players to pass for 4,000 yards in two of their first three NFL seasons. For his career, Luck has completed 1,052-of-1,797 passes for 12,797 yards, 84 touchdowns, 43 interceptions and an 86.2 passer rating in 47 starts, while also rushing for 900 yards and 12 touchdowns on 188 attempts. He was originally selected by the Colts with the first overall pick in the 2012 NFL Draft out of Stanford University. In 15 games this season, McAfee has recorded 64 punts for 3,018 yards, a 47.2 gross average, a 43.2 net average and 27 punts pinned inside the 20-yard line. He has also registered 90 kickoffs for 69 touchbacks (76.7%). McAfee leads the league in kickoff touchbacks, ranks second in net average and fourth in gross average. He has converted a league-high three-of-three onside kickoffs this season, has tied his own single-season franchise record for punts pinned inside the 20-yard line (27 in 2013 and 2014) and has set a team single-season mark for kickoff touchbacks. In Week 3 at Jacksonville (9/21), he set a Colts single-game record with eight kickoff touchbacks. McAfee was named AFC Special teams Player of the Month in September, AFC Special Teams Player of the Week in Week 6 and was recently named the team’s 2014 Walter Payton Man of the Year. McAfee holds Colts career records in kickoffs (477), kickoff touchbacks (233), punting gross average (45.8) and punting net average (39.1). He ranks fourth in franchise history in career punts (430) and punting yards (19,703) and third in punts inside the 20 (143). McAfee was originally selected by the Colts in the seventh round (222nd overall) of the 2009 NFL Draft out of West Virginia University. Vinatieri has converted all 28 of his field goal attempts and all 47 of his extra point attempts for 131 total points this season. He is the only kicker in the NFL to have not missed a single attempt in 2014 and could become the fifth kicker in NFL history with a 100 percent field goal percentage in a season (minimum one field goal attempt per team game). He would be the oldest kicker to accomplish the feat, as he turns 42 years old on Sunday, December 28. Vinatieri has made his last 34 field goal attempts, which ranks as the second-longest streak in Colts history and the fourth-longest in NFL history. This year, he also became the only player in NFL history to record 900 points with two teams (New England and Indianapolis) and recorded his 17th career 100-point season, which surpassed Jason Elam for the most in league history. For his 19-year NFL career, Vinatieri has converted 476-of-568 field goals for an 83.8 percentage, which ranks 14th all-time. He has totaled 2,137 career points, which ranks fourth in league history and first among active players. Vinatieri has also recorded a streak of 176 consecutive regular season games in which he has scored at least one point. He was originally signed by the Colts as an unrestricted free agent on March 22, 2006. Adams has totaled 89 tackles (69 solo), 11 passes defensed, a career-high five interceptions, two fumble recoveries and one forced fumble in 15 starts in 2014. He is tied for the NFL lead with seven takeaways this year and ranks second among NFL safeties with 11 passes defensed. He is also the only player in the league to post two multiple-interception games this season. 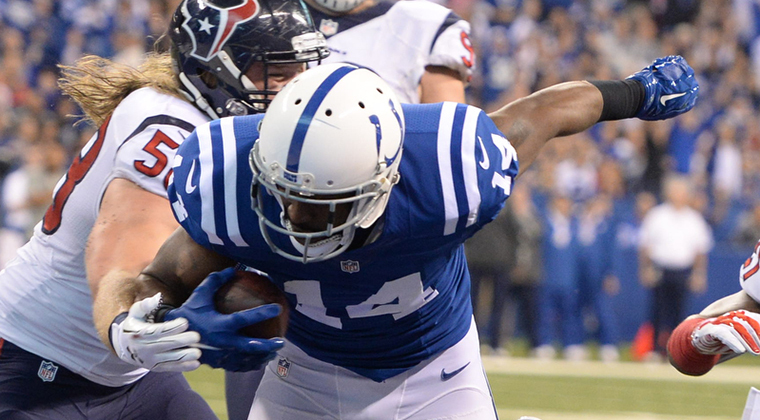 Adams was originally signed by the Colts as a free agent on June 12, 2014. For his 11-year career, he has registered 577 tackles (437 solo), 66 passes defensed, 18 interceptions, including one returned for a touchdown, nine fumble recoveries, five forced fumbles and 5.0 sacks in 161 games played (88 starts). He has also made 71 career tackles on special teams. Jackson has started all 15 games this season and has posted the second-highest single-season tackle total of his career (171), to go along with career highs of 4.0 sacks and four fumble recoveries. This marks his fourth consecutive 100-tackle season and the seventh overall for his career. Jackson was named AFC Defensive Player of the Week in Week 13 against Washington after he recorded 12 tackles (seven solo), two tackles for loss, one pass defensed and one fumble recovery, which he returned 35 yards for a touchdown. Jackson was signed by the Colts as a free agent on March 6, 2014 after spending eight seasons (2006-2013) with the Cleveland Browns. For his 112-game career (111 starts), he has notched 1,062 tackles (668 solo), 29 passes defensed, 15.5 sacks, 11 fumble recoveries, six forced fumbles and eight interceptions, including one returned for a touchdown. INDIANAPOLIS – The Colts (10-5) four-game win streak came to a sudden halt on Sunday afternoon in Dallas. It was a struggle on all three phases for the AFC South Champs in falling 42-7 to the Cowboys (11-4). Now, the Colts will close out the regular season next Sunday with a road game against the Titans (2-14). MORE SLOW STARTS—A taunting penalty on the Colts first defensive series extended the drive for Dallas and that came back to haunt the visitors. The Colts didn’t get their initial first down until a little more than five minutes left in the second quarter. Slow starts continue to plague the Colts. LACK OF RUN GAME– The Colts started the game with three straight runs in a clear effort to try and establish that area before the playoffs. It was tough sledding though on the ground. The Colts gained just one yard on 10 carries with the long rush of the day being just four yards. SECONDARY STRUGGLES – In holding DeMarco Murray to 56 rushing yards (came into Sunday averaging 116 yards per game on the ground), that was the exact blueprint the Colts defense wanted on Sunday. It was the Cowboys passing attack that proved to be lethal though. Tony Romo was 18-of-20 for 218 yards, four touchdowns and no interceptions on Sunday. INJURY WATCH – T.Y. Hilton (hamstring) was held out of Sunday’s game against the Cowboys. Two more key players joined Hilton on the sidelines in Dwayne Allen (knee) and Jerrell Freeman (hamstring). It will be interesting to watch how healthy the Colts will be heading into regular season finale in Tennessee. ONE MORE TUNEUP – The 2014 regular season for the Colts will end in Tennessee. From a seeding standpoint, the Colts will either be the No. 3 or 4 seed with hosting a Wild Card game the first week of January. A win for the Colts would give them a second straight year of sweeping the division slate of games. The Indianapolis Colts today signed tackle Tyler Hoover to the practice squad. Hoover, 6-7, 297 pounds, was originally signed by the Colts as an undrafted free agent out of Michigan State on May 13, 2014. He was signed to the practice squad on September 1 and was released on September 2. He then spent time on the Philadelphia Eagles practice squad before being released on September 30. Hoover played in 48 career games (23 starts) as a defensive end at Michigan State and recorded 93 tackles, nine tackles for loss, 7.5 sacks, six passes defensed, three forced fumbles and one fumble recovery. As a senior in 2013, he started 11 games and posted career highs in tackles for loss (4.5) and sacks (4.0). He was also named MSU’s Big Ten Sportsmanship Award recipient. This week’s “Back-Up of the Game” presented by Venyu is wide receiver Hakeem Nicks. The adaptation of the Colts offense has had to adjust quite a bit over the last few weeks. With the injuries to Ahmad Bradshaw and Reggie Wayne, the Colts skill group has been forced to throw some different looks out there lately. That has seen a diminished role for Hakeem Nicks compared to what the Colts free agent signee saw early on in the season. Nicks came into Sunday catching just three passes in over a month. On Sunday though, Nicks caught two balls for 44 yards, which ties the second most receiving yards he has had in 2014. His afternoon began with a 26-yard touchdown early in the second quarter where Nicks showed a nice ability to run after the catch and get into the end zone for his fourth score of the year. Then on the Colts next touchdown drive there was Nicks showing his ability to go up and get it, something coveted during the free agency period, with an 18-yard sideline grab. With the extra attention building each week for T.Y. Hilton, there will inevitably be favorable matchups for the Colts offense going forward. “I just wanted to go out there and make plays and they called my number and I showed up,” Nicks said after the Colts 17-10 victory.